If you’re planning a wedding in winter, consider a Christmas themed day! There are a lot of Christmas wedding ideas that help you transform your day into a festive wonderland. We’ve picked out 40 fun ideas to add a Christmas twist to your wedding day. Choose a magical winter wedding place to set the scene. Design your wedding invitations like Christmas cards and send out to make your guests feel festive. Hire a sleigh pulled by reindeers to arrive in! Decorate your wedding place with pinecones, holly, and baubles, or lots of tinsel and glitter. Dress up your flower girls and page boys as Santa’s elves! Sing Christmas songs during your day. Add Christmas themed things such as Santa hats, candy canes to your photo booth. Give Christmas themed socks to the groomsmen for a fun photo. Instead of canapés and bubbly, serve your guests with festive drinks and mini mince pies. Decorate the chairs at the reception or the pews at the ceremony with snowflakes or mini wreaths. Add snowflake decorations wherever you can. If there is a fireplace at your venue, hang stockings in your wedding colors across it. If there’s a Christmas tree, you could put mini presents under the tree! Ask to decorate the Christmas tree at your venue with colors to match your wedding color scheme. Get your wedding table names associated with Christmas. Ask to dress up the master of ceremonies as Father Christmas. 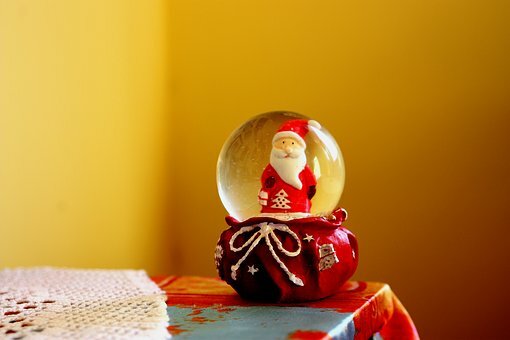 Candles surrounded by holly will look amazing, or fishbowls filled with glitter can look like snow globes. Lighting cinnamon scented candles to get the festive feeling. Don’t forget to place tubs of chocolates around the room for your guests to dip into. Hang stockings across the top table.